Here is our beautiful arrangement of paint chips cut into strips. I used a paper cutter which worked out really well to cut pretty straight strips. You may even be able to find paint chips that are already long thin rectangles to form into chains. Grab a stapler and your ready to go! These chains would make a great decoration for Spring to brighten up any room. They would also be a great decoration for a rainbow themed birthday party which I've seen at the blogs The Imagination Tree and Paint Cut Paste. Two great blogs with amazing ideas! Still having fun and thinking of more ideas with paint chips!!! Use paint chips in "earth" tones or "grey" tones to make a collage for a rainy day! 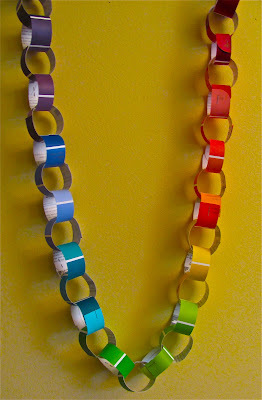 Do you have any other ideas for a Paint Chip Chain Garland besides a rainbow themed chain? Thanks Anna! Only bright colors after this Winter! Loved picking out the paint chips the best! Time to go back to the home improvement store! oooh, look at all those colors! 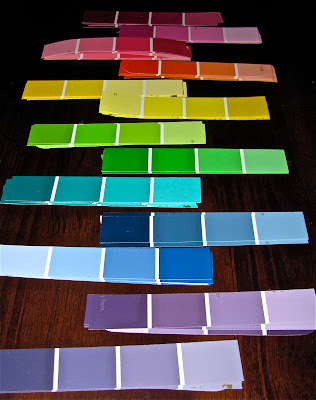 that's a fun way to use paint chips -- totally new to me! what other paint chip wonders do you have up your sleeve? Hmmm, you've got me thinking! LOL! Melissa, these chains are nice - very colourful! They could be used to decorate a "tools and workshop" center quite nicely with the paint chip idea. The beautiful selection of colours, when offered to children, would be very inviting. oh so colorful, love it!! We pick up paint chips too, have used them to make number/alphabet cards. Great recycling craft! One of these days I'm going to be banned from Home Depot for snagging paint sticks and sample cards to make fun crafts like this one! Looks great, lovely colours! Would be great at a rainbow themed party. this is so great. I just made a paint chip birthday banner on my blog! so they would go together perfectly for a party. simple and easy idea. love it! great blog. Splendid idea, oh so much fun! Thanks for linking up to Beyond The Picket Fence. Great idea Melissa! Lovely for birthday parties - all the guests could help make one. I am absolutely in love with this, I have a crazy thing with hanging garlands and chains and streamers all over my house. I NEED to go to the home improvement store and start stashing paint chips in my purse! Thanks for linking to Creative Juice! Hope to see you back this week! Very fun idea! Thanks for inspiring us. brilliant idea! thanks so much for sharing this and all your other projects on Craft Schooling Sunday! Very cute and colorful, great for when working on colors! Thanks for linking up! Hi! I featured this project on Fun Friday Finds today. I hope you will stop by and check it out. 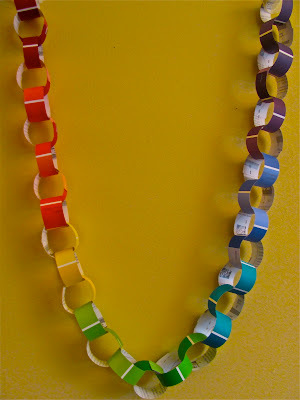 Rainbow Chain is really looking like a rainbow, its smart one.